This is a wonderful book. Between the covers of a surprisingly slim paperback, David Archer has distilled nearly everything a concerned undergraduate student could wish to know about the workings of the climate system. The book assumes nothing in the way of mathematical or scientific background knowledge and is written in a jaunty, hip tone that I believe appeals to the denizens of large undergraduate lecture halls at American universities. Given these rather daunting constraints, the author has done a magnificent job of describing much of the fundamental chemistry and physics governing the climate system. Based on an undergraduate course developed at the University of Chicago, Global Warming: Understanding of the Forecast is a tour de force of elegant explanation and didactic brilliance. Each chapter ends with a pithy list of ‘take home points’ to ensure the reader has grasped all the key facts, as well as few online ‘projects’ that help to take issues a little further and consolidate learning. I cannot recommend this book too highly; it is a well-written, evocative exposition of one of the most important issues of our time. An excellent book for anyone serious about understanding the causes and impacts of global warming. Summing Up: Highly recommended. All levels. David Archer's book is an accessible, entertaining, but detailed account of how scientists are trying to predict future climate change. It is an excellent book and should be the first port of call for anyone wanting to delve deeper into exactly what goes into those global warming forecasts. 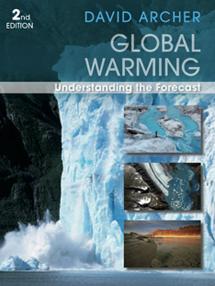 The climate books by Flannery, Kolbert, etc. tend to be anecdotal, with qualitative descriptions of how the climate works. While I think those books are valuable, what's been missing is a more technical description of the physics of the climate system that's accessible to people who aren't physics majors. This book is it. It serves as a bridge between the fully qualitative books and highly technical textbooks requiring calculus. There is some math in it, so math-phobes might approach it with caution. I think the book would be especially useful to scientists or grad students who want to know something about the climate problem, but don't want to invest a lot of time in reading dense textbooks or journal articles. I'm going to have my incoming grad students who did not major in atmospheric sciences read it in order to educate themselves quickly about the climate.